With Chennai Superkings having already qualified for the playoffs and Delhi Daredevils long out of the tournament, today’s match had the prospects to be a friendly if not for us exciting permutations and combinations. With a win for CSK meaning they will finish in the top 2 for sure this year, the stakes are high for them to make that coveted top 2 spot their own which will give them two shots at making the final of this year’s Indian Premier League. Delhi on the other hand will be fielding youngsters who’ll be eager to put on some good performances in front of the home crowd and rove their mettle to the selectors for the coming season. The interesting to watch DD vs CSK Today IPL Match. With everything going right for CSK this year and everything possible wrong for Delhi, this match couldn’t have been more one-sided based on form. However, Delhi who have been knocked out of the tournament have seemed to come alive after their dismay. Freed up with nothing left to play for has seen Delhi’s young trio of Shaw, Pant and Iyer explode, launching the team to huge totals on the back of their performances. Boult and Mishra have also come to the party and the duo has the capability and talent to give the likes of Raina, Dhoni and Watson jitters when they come visiting. We hope Gautam Gambhir is given a run out in the final two games of the season and with it the chance to lap in the adulation of the ever faithful Delhi crowd. 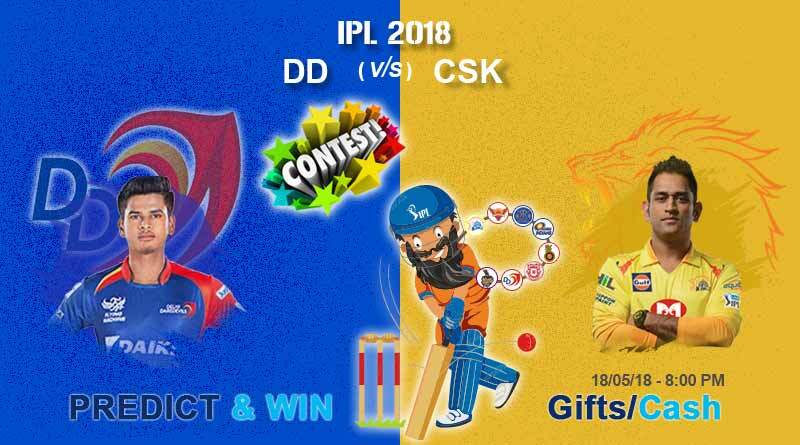 DD vs CSK Today IPL Match is sure going to one of the most exciting matches of IPL 2018.